The Sol-Ark solar generator (solar power system) is EMP hardened. Not just EMP resistant – it’s actually EMP Hardened! Why is this important? Electromagnetic pulse is not science fiction. It has become a real potential threat in today’s technological world. The electrical grid is essential for our modern way of life to exist. And a EMP attack could bring it all down – for a very long time. Likely, those who are preparedness-minded already realize or know this. And some will attempt to mitigate the potential issue with an alternative energy system. After the initial investment, and as long as the sun is shining, solar panels will deliver power into the home. No grid required. There’s a problem though… when considering the potential damaging consequences of EMP or CME (coronal mass ejection from a major solar flare) or even lightning. How does one protect their investment? EMP/CME or lightning will damage the electronics in the solar charge controller / inverter. I have finally found a company who designed their solar charger / inverter systems to be EMP hardened to military standard MIL-STD-461G. Actually one of their systems is designed twice as robust to that specification! Evidently over 8 months of testing went into their Solar Flare / EMP Hardening design. Of note, one of their engineers tested solar systems and panels at White Sands New Mexico EMP test range. During 2018, NTS Testing and Certification Services verified the Sol-Ark 8K Solar Generator withstood >100KV/m EMP while in use. (twice the spec of 50KV/m). 100KV/m was the limit of NTS test equipment. Sol-Ark uses 6 specific technologies to achieve this protection. It is so effective that during NTS testing & certification, the same 8K unit was pulsed over 140 times with 3 axis of rotations without impact. You can download the third party testing report here. Their system can operate as grid-tied, hybrid, or off-grid. 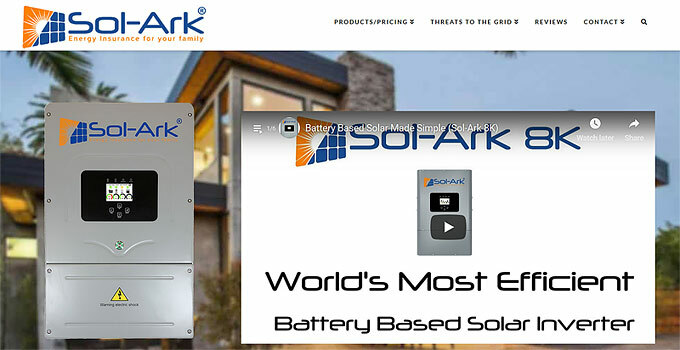 Veteran Owned, Sol-Ark designs and builds the world’s most efficient battery based hybrid inverter on the market. The Sol-Ark 8K is 96.5% efficient! I invite you to check out their website. If you’re ever in the market to consider a 120/240V split phase 8,000 watt EMP Hardened solar generator system, Sol-Ark is your answer. They presently advertise with us, however I wouldn’t have them here if I didn’t believe in their product. I have designed and installed a few of my own solar powered systems – and I know and understand the specs. I have been looking at systems for a while now. Sol-Ark is on the top of my list for cool systems. I hope to be building within 1-2 years. I plan to get Solar for a little homestead. Very encouraging- they even have a work around to the issue of many utilities backing away from the net metering scenario. Definitely worth a look. EMP hardening is the icing on the cake! I had the opportunity to meet Tom and the folks from Sol-Ark at a prepper show in late 2015 and knew they had a super product from the start. I purchased their first model, a 3K unit (with 6 panels and 8 batteries), in 2015, and just recently upgraded to their new 8K unit (with 6 more panels). I couldn’t be happier. The only thing I haven’t been able to get working is the phone app, but that’s just a question of having time to get someone on the phone at Sol-Ark to help walk me through the setup. My computer recognizes the associated wireless connection, but I just can’t convince my phone it’s there. Sol-Ark has had rapid progress and well deserved company growth. Anyone I’ve ever spoken with has always been super helpful, and return emails are almost instantaneous. The 8K system is a bit pricey, compared to a “build it yourself” solution, but for someone that doesn’t thoroughly understand technical electronics, it is a great “plug and play” solution! Plugging it in to have it work is for me, I do not have the time for trying to construct something as a back up power unit. Thank you for the information on this power system. The Sol-Ark EMP protection design is the most important part of buying this system. I have Faraday cages and tec- protect EMP bags to protect my small Kodiak system but what’s the point if you are not using your solar power to save money. The Sol-Ark is definitely on my to do list for prepping. Not only will it keep EMP ‘out’, but conversely and logically it will (should) keep any internal ‘noise’ or EMI (electromagnetic interference) ‘in’. I need to get in touch with them about this, but low EMI will be good if you’re a HAM radio operator. Why? Because many solar charger/inverters give off plenty of EMI, which can be heard when you tune radios, certain frequencies, etc..
Of note, I’ve researched it and the ‘Sunny Boy’ inverters are supposed to be excellent in this area. Though I would think that the Sol-Ark should be good too… Maybe someone form Sol-Ark can chime in about this. My present / primary inverter is an older ‘Outback’ model. It gives off lots of EMI. Oh well… If the budget ever permits, I will be upgrading (for more reasons than one) . Good comment. Sol-Ark 8K has very low EMI because of many different filters on every wire coming in and out of the 8K. And we cannot use a plastic shell. Only an aluminum faraday cage (Sunny Boy does this too). I am sorry it is expensive. It is 30% cheaper than Outback, Sunny Island, and others. And the high efficiency allows 10% less solar panels and 10% less batteries than most. That saves a lot. And if you compare to cheap inverters that cannot sell back to the house or grid, they end up costing much more than an inverter that saves you a lot of money per year. Still I do wish the cost of Sol-Ark 8K was lower. Ken, one thing I would like to see is Sol-Ark manufacturer a portable solar generator like the Kodiak, but with EMP protection like the larger models. Looks like a very nice system. Way too much $$ for a poor boy, like me. I have done the diy thing. Made a few mistakes, nothing major, along the way. I guess I’ll have to get by with extra controller/inverter in faraday cage. I suspect many of us, have to do things a little at a time $$$$. I wish I could afford to start from scratch. I’d do a few things differently. Overall I’m pleased with what I’ve got. Nothing about solar/wind is inexpensive, though there is plenty of cheap stuff out there. Congrats Ken, on the new advertiser. Looks like a quality product. PM, but what if 2 EMPs go off? I’m sure most who have looked into EMP/CME, have thought about your question. A CME could be hazardous to electronics (plugged in especially) for several hours or even days. I encourage you to understand the differences, E1, E2, E3, etc. if you don’t already know. A second or multiple emp attacks is definitely a consideration. I plan to think long and hard, then play it with the info available. When do ya bring out all your goodies from the faraday cage? Well, it all depends doesn’t it. Everything will be a gamble in that scenario. I think I could easily survive a few days or weeks, without the goodies. The goodies would definitely make life easier. If I had the $$ the Sol-Ark would certainly be a great way to go. Problem is, I don’t have the $$. So I guess I have to get by the best I can. No one can know how destructive a particular hemp or emp or solar flare or cme will be, to a certain location from all the variables. I am currently utilizing the power provided by my panels and small turbines. I use all the power they can generate. I do have two separate battery banks and two separate charging systems using solar and wind. Hopefully, my back-up invertor(s) and charge controller(s), can be used to replace damaged equipment. Through trial and error, I’ve found it is far more efficient to use the power than trying to store it. A lot of loss involved with storing the power. I do store what I can in the battery banks. If a storm is in the forecast, I allow the banks to fully charge. Like I said in a previous post; If I had it to do over again, I would do a few things differently. I had to do it a little at a time and therefore ended up with two distinct systems. It was the best solution for me, considering what I had and I can make this work. I truly envy those who have the potential for hydro-electric. There are some sweet items for that technology, even on a small scale. Pm, there has been a lot of talk in the prepper communities that if an enemy set off an EMP, they might wait a couple of weeks or months and set off a second EMP frying everything that was pulled out of the Faraday cage. Please give a review of sol-ark, if you end up with one. Thanks for the nice article. If people are interested in learning about various battery based inverters, here is a YouTube webinar we did for 50+ installers. We do lots of educational ones like batteries and EMP testing. I have 2 8k systems. We started with the 3k which functioned flawlessly. We have the 2 8k systems because we live in the middle of nowhere and our electric supply is unreliable at best. We had a generator back up for power but it blows through lp gas. The system is super efficient and runs our computers, refrigeration and all critical loads easily. Having the EMP hardening also protects from surges, lightning and other anomalies. We are generating more energy then we consume for the core of our farming operation. SolArk employees have exceeded any expectations for education, service and support. They are always available to answer questions and share knowledge. We have recommended them to many people and all of our close friends.